Models BB1208, BB1216 and 1222 were added to the Bark Blower family in 2003. These units were designed specifically to do a couple of things: convey the heaviest of materials (loam, stone etc.) and to convey large volumes of lighter materials (bark mulch, compost, playground chips) to large areas very quickly. the added benefit of being straightforward to use and maintain. The Finn model BB302 has been the most popular unit among Hydrograss customers here in New England. With over 150 machines working in the field, this machine has proven it’s durability and performance, time and time again. 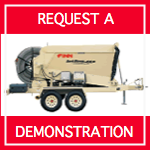 Model BB302 can easily apply 12-15 cubic yards of material per hour through the included 150 ft. of 4" flexible discharge hose that is conveniently stored on the included hose reel. "Our first machine saved us 700 hours in labor during the first week we owned it. We put guys to work in other areas to help us grow. Now we are making money on every mulch job we do. 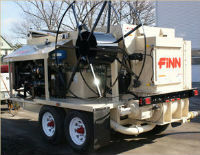 If we had not bought our FINN Bark Blower, we would not be as big or as profitable of a company as we are."